When a good Samaritan arrived at the shelter while carrying a dying, emaciated dog, nobody knew whether they'd be able to breathe life into her freezing-cold body. The Dodo spoke with Emily Halgrimson, the founder of Happy Tails Rescue, who answered the call from the Humane Society of Hobart to save the hypothermic dog. After hanging up the phone with the shelter, Halgrimson immediately said goodbye to her own dogs at home and got in the car to pick up the dog - whom the shelter named Polly. "[Polly] was cold to the touch," Halgrimson told The Dodo. "She was definitely dying." "She was in the isolation room. ... They were keeping her warm with hot water bottles," Halgrimson said. She put towels and blankets in the back of the car with Polly, so she would be warm on the ride to the vet. "She lifted up her head a little in the back of the car," said Halgrimson. The small movement gave her hope that Polly was going to survive, and that's when Halgrimson captured the photo below. Halgrimson took Polly to the Westchester Animal Clinic, rather than the emergency room, because the clinic works with the rescue on a regular basis and often provides generous health care for dogs without funds to pay the bills. "The vet tech tried to take her temperature," said Halgrimson. "At first she thought the thermometer's battery was dead, so she went and got another one." "She realized it wasn't the thermometer," Halgrimson said. "It was [Polly] being so cold." Halgrimson wrapped Polly in her sweatshirt to keep her warm, and Dr. Larry Reed began the examination. Surprisingly, Dr. Reed said there was a chance: Polly could live. He set up a bed for Polly in a heated room to keep her body warm, and gave her as much food and water as her frail body could handle. Little by little, she started to drink more. And eat more, too. Then, something amazing started to happen. Her spirits lifted and her tail began to wag like never before. "We couldn't do it without our vet. He works with a lot of rescues in the area, and he's known for doing stuff like this and charging very little," Halgrimson said. "Miss Polly continues to surprise everyone with how well she's doing. It seems like everyday she takes another big step forward," Happy Tails wrote in a Facebook post. "When you see her in person you can't help but think, 'This dog should not be alive' - she's that skinny. But there she is, alert and loving and fighting hard every day. A little miracle." On Monday, Dr. Reed told Happy Tails that he expected Polly to make a full recovery. "She's been moved from the hot room to the regular treatment area and she's loving all the attention she's getting from all the staff who are now nearby," the rescue wrote in a Facebook post. "She rolls over for belly rubs and the staff even caught her standing up all by herself to drink out of her water bowl." "We're thinking she may be ready to come to her short-term medical foster home at the end of the week. Then onto a longterm foster or foster-to-adopt home," the post read. "Amazing - from near death to walking in one week. She wanted to live." Since posting Polly's story on its Facebook page, Happy Tails has received more than enough money to care for her medical expenses. Now, any additional donations will go toward helping the rescue's other dogs. "We have a Yorki named Abby. Nobody wants to adopt her, because she's special needs," Halgrimson told The Dodo. 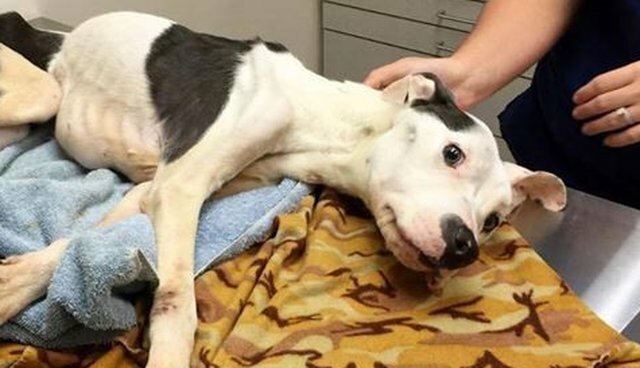 "She was so badly abused and neglected ... We think she was kept in a small crate for so long that the urine and feces built up in the back, so she couldn't stand up." When the rescue first took in Abby, she had matted hair that was inches thick, but now she's a fluffy dog who needs an owner willing to deal with diapers and eventually a doggie cart. If you like the work that Happy Tails is doing, check out their Facebook page and website. There, you'll be able to find more information about donating, fostering and adopting. Below are a few more photos of Polly's time healing.